Caterline are not only able to supply and install your catering equipment, we can offer you comprehensive catering equipment maintenance contracts as well. All stock, new and reconditioned, is under a Caterline equipment guarantee – For your total peace of mind. The best way to keep your kitchen equipment operating at an optimum level is to have it regularly maintained by our fully qualified and highly experienced engineers. From one off jobs to ongoing service contracts, Caterline can provide you with a comprehensive maintenance and repair service that fits in with your requirements. All of our team have many years experience in maintaining and repairing commercial kitchen equipment and their expertise extends across all the major brands. Regular maintenance of your catering equipment will help you to avoid potential breakdowns which can be very costly to your business. Our team of engineers can make sure that your equipment is operating the way it should be and identify any common issues that may be arising and correct them quickly for you. This will extend the life span of your equipment and save you money in the long run. All kitchens are different so the maintenance contract will be tailored to your requirements. We can advise you on the best type of contract to have once we have evaluated your kitchen and established how often the equipment is used. We will always try to work in line with your budget and offer you a practical solution to your needs. If you would rather use Caterlineltd for one-off repairs and services and not have a regular maintenance contract that’s absolutely fine. We are more than happy to work to your requirements. 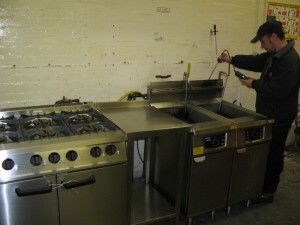 We would advise that at the very least your commercial kitchen equipment should be serviced once a year. We can offer you a value for money maintenance service that will give you the peace of mind that all your equipment is safe to use. If you would like to find out more about our professional catering equipment maintenance service please do not hesitate to contact us on 01384 459111 and speak to one of our helpful team.